“A long time ago I promised to think more about the crown of weeds in King Lear. On October 12, 2012, more than two years since I made that promise, I was given that opportunity in public. I participated in the creation of a tradition at UNSW that involved the actual construction of a weedy crown. On this day Professor Deborah Bird Rose crowned me with weeds to celebrate the submission of my PhD*. Hopefully future students in the Environmental Humanities** will also be similarly crowned! The tradition was the collaborative brainchild of Drs Eben Kirksey, Thom van Dooren and Ms-not-quite-Dr myself and made with the assistance of Diego Bonetto, Sydney’s own King of Weeds. Eben suggested I make a costume to celebrate my submission, Thom was amicable to this idea, I came up with the idea of crowning myself with weeds and Diego helped me select the edible weeds. On a frosty morning Diego, Carin (from Slow Food Sydney) and myself went walking along the Cooks River and Wolli Creek in search of rogue edible plants. Below are a series of photos that capture the creation of this foraged weedy crown. My PhD is on the storm in King Lear and during his time in the storm Lear strips naked and then crowns himself with weeds. 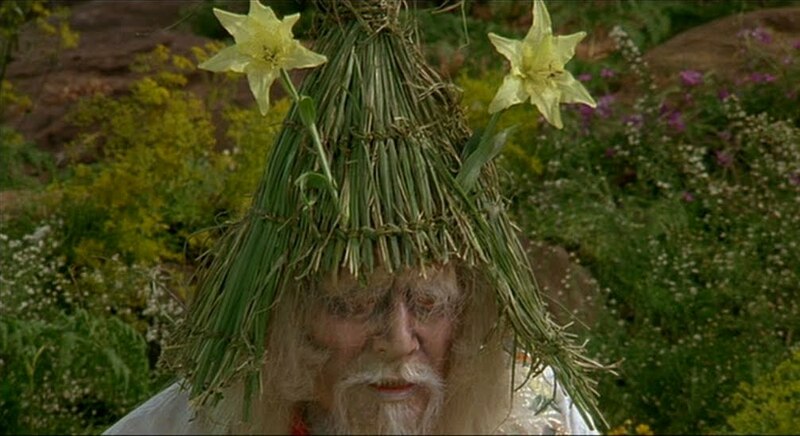 My favourite interpretation of this crown is from Akira Kurosawa’s 1985 Adaptation Ran (Chaos). I wanted to make the crown because I like what it represents. It is usually considered an indicator of Lear’s madness or the chaos in the kingdom. But I think the weedy crown represents the promise of an alternative political order. Taken out of its dramatic context, I think a weedy crown can be worn by anyone (of the 99%!) to represent an alternative way of imaging and living in the world. For me this alternative world positions disorderly natural forces (such as weeds, parasites and storms) and the unwieldy patterns of life and death at the heart of a refigured body politic. This post comes with two disclaimers. *Firstly, I have not yet received the award of PhD, given all this attention I can only hope I pass! **I am a student of English at UNSW, not Environmental Humanities but I have been teaching in the Environmental Humanities and it was lovely of them to help mark this occasion. When I do finally receive the award, however, it will be through the English department. This entry was posted in Cultural diversity, ethnobotany, foraging, history, Other's Weeds Art, wide weeds debate, Wild Stories and tagged crown, folklore, history, King Lear, litterature, narrative, Shakespeare, weeds. Bookmark the permalink.